Over the past couple days I have received word from different friends regarding people I knew and graduated from high school with. I was informed by a friend that Kris Irving and Tanner Mounts, both in my graduating class, have passed away. Kris died in a car accident and Tanner died from a drug overdose. First is Jackie Loffer. She and I had a few classes together our senior year, and had known my wife since elementary school. She was a sweet and caring person with a love for music. She sadly passed away on the anniversary of her mother’s death from an aggressive cancer at the age of 24. Lastly is the person that actually kicked off this blog entry, David Clark. He was shot and killed April 26, 2008 in a police standoff. Clark died from a gunshot wound to the back. He had previous incidents with law enforcement over threats, displaying a weapon in public, as well as following a Whatcom County Sheriff’s detective. All of these incidents ended up with his right to own a firearm being suspended. It disturbs me that this occurred without his appearance in court; however in this case I can NOT say that it was unjustified. Police eventually were called to his house after a call for disorderly conduct. Three other individuals that were present left without incident. Clark instead of acting like the three other individuals brandished a weapon, resulting in SWAT being called in. During the standoff officers ordered him to exit his house, this by no means was unreasonable. When he did exit his house he was again brandishing the weapon at which time officers instructed him to put the weapon down, again not unreasonable. Evidently he eventually attempted to charge police with the weapon, at which time they shot him with bean bags attempting to immobilize him, this by no means exceeded the level of force shown by Clark, and actually they were remaining below it. Evidence from the medical examiner also showed that Clark had been tased by police twice, again evidence of the attempted use of non-lethal force. While I will most certainly debate that tasers are not 100% non-lethal, they are certainly less lethal than a firearm. In the commotion two other officers discharged their weapons. 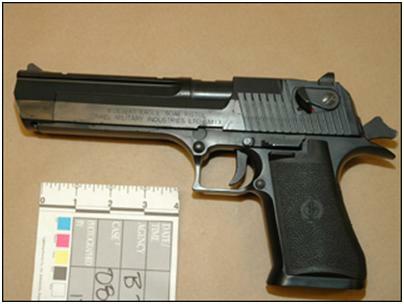 was manufactured to appear as an authentic Desert Eagle. “The design, heft and size of the weapon appeared authentic and deadly, even when it was actually handled by the investigators,” Bellingham police said in a prepared statement. Those of us who have been raised around firearms and weapons are raised to know and understand that the assumption by anyone is that weapon is loaded at all times. This weapon was manufactured to look real, and as such was presumed to be real as well as loaded. As a civilian on the street if someone pointed it at you, it would presumed to be locked, cocked, and ready to rock. As can be seen by the hammer being back, safety off, and nothing else about this weapon indicates that it is merely a pellet gun. I can say that if a man approached me on the street and I saw that in his hand, I would draw my weapon immediately and place it at the ready to my side and attempt withdraw myself from the situation. While I would not point it at the individual, he is presenting himself as a threat, if it was holstered, who cares, however it is in his hand implying intent to immediately use it if necessary. My weapon being concealed this raised the question of why I am a threat. Should he raise that weapon towards me, I would consider him hostile just like any other thug and engage just the same. The weapon is designed to look real, and as such when handling it, you must expect that those around you will treat it as such. He was sick and needed help. He struggled to maintain his hold on reality and we (friends and family) gave as much support as we could. With the number of things he had done recently a trip to the court house was most certainly in order to get him professional help whether he felt he needed it or not. Brandishing weapons in public presents a safety issue to himself as well as the public. I am a very big concealed and open carry supporter. However brandishing weapons does nothing but cause larger more dangerous problems. Another comment she makes is regarding the fact that he was shot in the back. Actually from the ME’s report he was shot in the lower right back, and that the bullet impacted his liver and the lower lobe of his lung. They didn’t just wait until he was running square away and take a clean shot. What occurred from my reading of the evidence I have been able to find is that when non lethal force did not stop David, two officers responded with lethal force to protect the people he was charging at. With the level of force that David was presenting against the officers, the two officers who shot were perfectly justified. While it is extremely sad to have lost a friend I knew from high school, I in NO way blame the police officers involved. From what I have seen their efforts to end the situation peacefully could be fully commended. While we always hope for a better outcome, it doesn’t always occur. Even more importantly than that, both parties must desire that outcome for a 100% chance of success.